The British Chess Problem Society is pleased to announce a new award designed to continue the work of the late Sir Jeremy Morse and to perpetuate his memory. Composers are invited to send their two-movers (#2) which they believe to be tasks or records published anywhere in the world within the period 1.1.2012 – 31.12.2016 (but not already to be found in Sir Jeremy’s book). The problems of deceased compatriots published within the same period may also be submitted. Entries should be sent as an email attachment in pdf format (one diagram to a page) to Michael McDowell (or to Michael via the ‘Contact’ menu item above) by 31.3.2017. Not more than 5 problems (no later substitutions permitted) may be submitted by any one composer. Give publication data, full solution and comment if desired, state the task achieved, and add your name and email address. Show C+ if computer-tested. The judges will be Peter Gvozdják, Marjan Kovačević and Michael Lipton. No judge will assess his own problems. It is intended that the Award will be published in The Problemist before the end of 2017. Thereafter the C. J. Morse Award for 2-move Tasks and Records will be held every 2 years. A prize fund of up to £100 will be available. Several members have been asking about the third edition of the late Sir Jeremy Morse’s Chess Problems: Tasks and Records. The book is now available, at a very reasonable price, direct from the publisher’s website. First of all, I apologise for the lateness of this press release, which appears nearly a week after the event it reports on. This report is not normally my responsibility, but this year the person who has written the press-release for the last few years has not been available. The British Chess Solving Championship, sponsored for several years now by Winton Capital, is a year-long event culminating in a final very much like an exam. This year’s final was different to previous years in two ways. First, the event was part of the World Solving Cup, run by the World Federation for Chess Composition. Second, thanks to the very welcome assistance of Phill Beckett, an ECF official for junior chess who has, over the last year or so, been introducing juniors to chess solving, three juniors were invited to compete in the final. 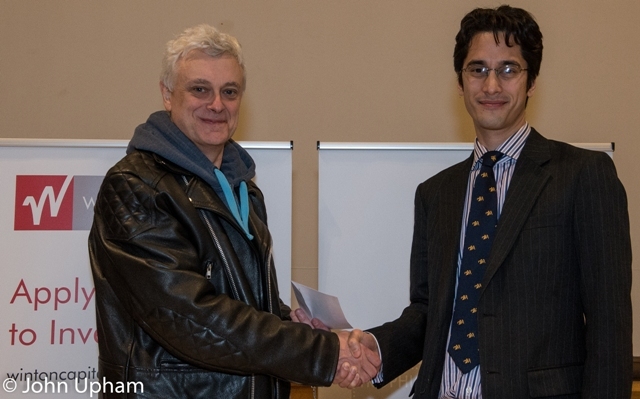 There were three prize funds, one for the British Championship, one for the foreign solvers and one for the juniors. The attraction of the World Solving Cup encouraged 11 foreign solvers to enter. They represented Belgium, Germany, Morocco, the Netherlands, Poland and Slovakia. These, together with 22 British solvers and the 3 juniors, made up the total of 36 solvers who sat down at 12:30 on Saturday 20th February at Eton College to solve the three ‘mates in 2’ in 20 minutes which make up the first round. There were five solving GMs, 2 solving IMs and 3 solving FMs, making this probably the strongest British Chess Solving Final ever. At the end of that first round just twelve of the solvers were on full marks. Solving such problems against a tough time limit is hard work and even more so when tricky problems have been specially selected! As usual, none of the elite solvers tripped up. The second round is two 'mates in 3' in just forty minutes. Again, for the elite solvers, this is not too much trouble, but even so, after this round the number of solvers on full marks had decreased to just six. Two endgame studies make up the third round and solvers have an hour to solve them. The first one was rather easy, but the second beat everybody in the room. Nobody saw 7.Rg6! Of course, such a study (or problem) that nobody manages to solve doesn’t help to differentiate the top solvers, but the director (me) was nonetheless content as this round ensured that nobody would end on full marks and nobody would end on zero. Such has always been my aim in this event. I believe that the top solvers need to be challenged, but also that the lesser lights have to be encouraged. The fourth round, the Helpmates, can sometimes be easy, but they weren’t this year. Each had two solutions but only 2 solvers got full marks. Many solvers got just one solution of the shorter problem and just 2 solvers got both solutions of the longer problem. The Finnish composer of this second helpmate is reportedly delighted with the mayhem his problem caused! The two mates in 4 moves (or longer) that make up the fifth round are always a difficult challenge, even for the top solvers and only three of them got full marks this year. The first problem is by Vladimir Pachman (Grandmaster for Composition) who was the brother of Ludek Pachman (Grandmaster otb). His problems have very often been selected for this kind of event. The last round, two selfmates in just 30 minutes, is likewise always a tough challenge, especially after a very full few hours of solving with only short breaks between rounds. Only 3 of the competitors got full marks, with the second problem, a classic selfmate in 4 by Philip H. Williams, causing most of the trouble. Williams was a leading figure in the chess problem world in the early years of the twentieth century and edited the problem section of The Chess Amateur. The three juniors (Theodore Diaz, Dan Southern and Miss Jia Feng) found it very tough going, but nonetheless all three gave the problems their full attention throughout the event, thereby justifying their invitations. The detailed results can be found here and details of the prizes are here. The problem and studies used (with solutions) can be found here. In closing I would like to express my thanks in several directions. Firstly, of course, to Winton Capital for their generous sponsorship, which helps with not only this event, but also with the annual International Solving Contest and the expense of sending the British solving team abroad for both the European and World Championships. Second, I must thank the committee of the British Chess Problem Society who have entrusted me with running this event for the last quarter of a century. This has been my last year and I wish my successor(s) all possible luck in taking the event forward. 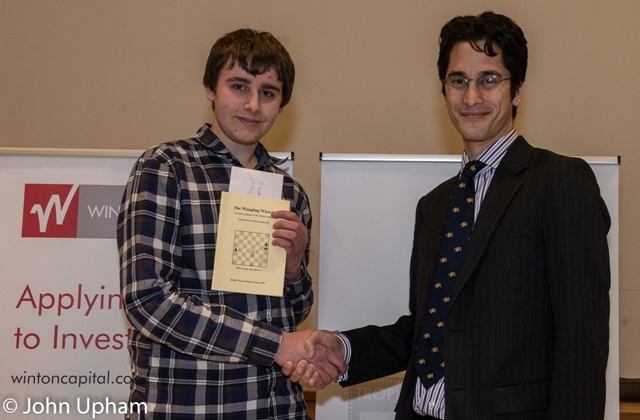 They will discover that the regular entrants are amongst the most friendly in British Chess. Finally, my grateful thanks go to my good friend Neal Turner, who this year helped me select the problems. He was responsible for the selection of nine of the problems (including the helpmate in 4 and selfmate in 4 that did most of the damage), while I merely provided two problems and both the endgame studies. 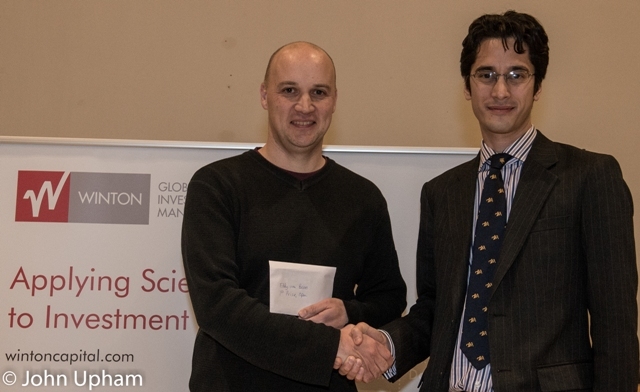 And now a few photos of the prize-giving. All are Copyright © 2016 John Upham Photography. Open winner Eddy van Beers receiving his prize from Winton’s James Brilliant. British Championship winner John Nunn receiving his prize. Junior solver Dan Southern receiving his prize. 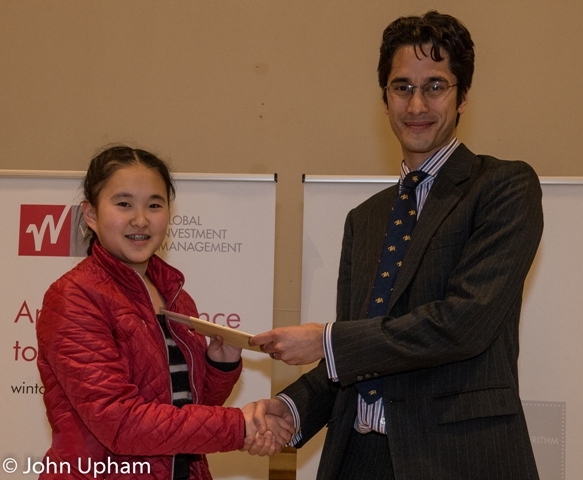 Junior solver Jia Feng receiving her prize. The BCPS is sad to announce the death this morning of our former president Sir Jeremy Morse, who was distinguished also in the worlds of crosswords and finance. More details will follow, but readers may be interested to read an article on Sir Jeremy's chess life written by our current president GM John Rice. I am pleased to announce that the BCPS Members’ Area website has now been restored and should be in the same state it was when it was taken offline. Just my BDS Website to restore now and I’ll try and get that done in the next few days. After being offline for three days, the BCPS Website is back online. I hope to get the Members’ Area back soon. My website, the BDS website, got hacked on the morning of Thursday 31st December 2015. The content of the site was not affected, but it was harbouring a virus and so I took it offline. The other sites on the hosting account, this one, The Members’ Area and the Sheffield Chess Congress website, were not affected, but were also taken offline as a precaution while the account was cleaned out.